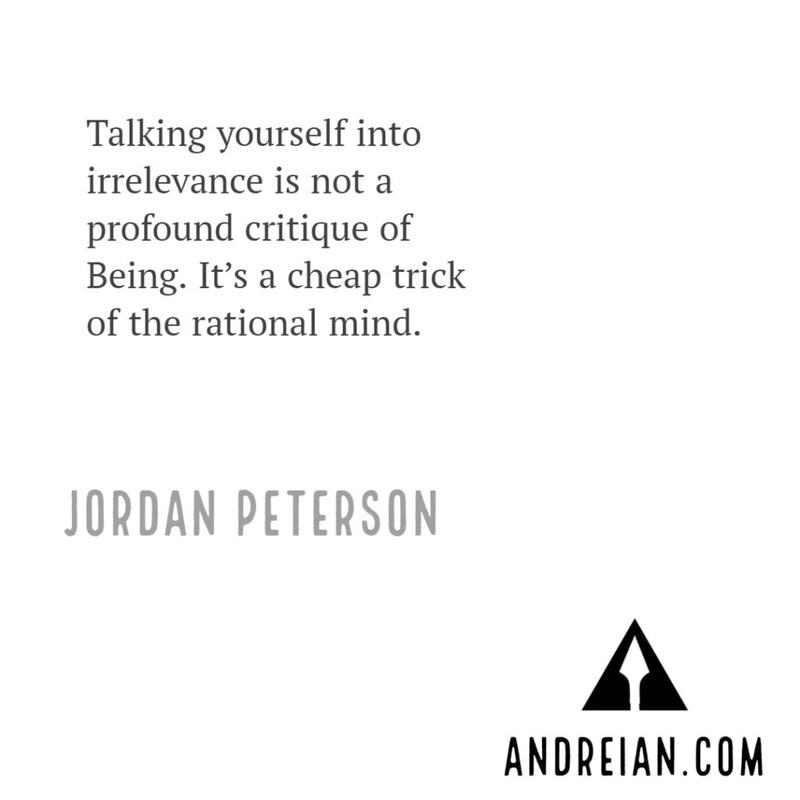 Jordan Peterson is a modern-day Aristotle. His quotes; from interviews, and from his work as a lecturer and author, are full of wisdom–difficult to digest at first read. 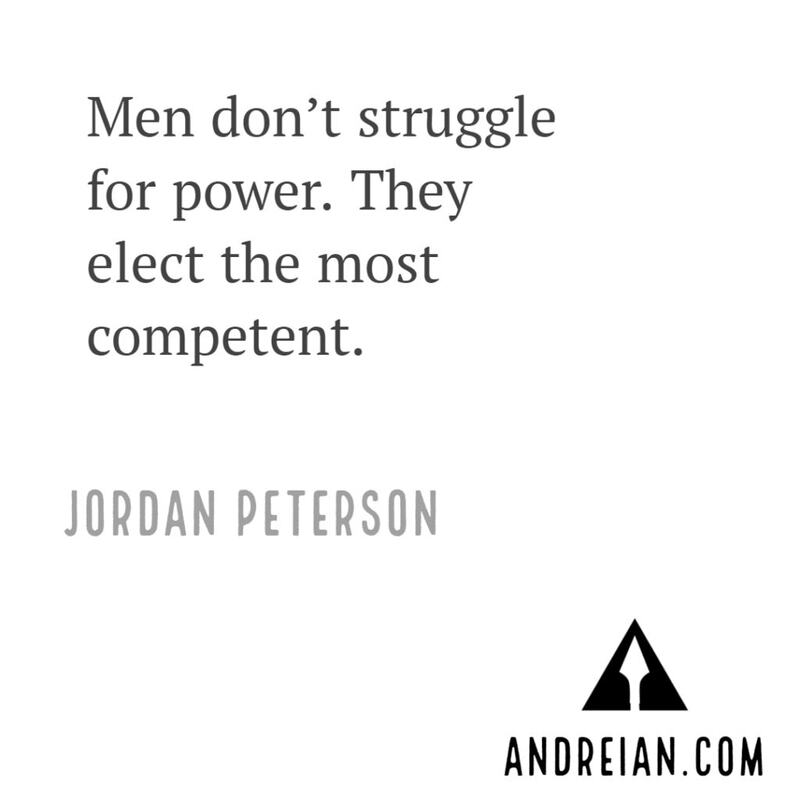 Jordan Peterson is a psychologist with a firm stance against Social Justice, and pervasive, toxic-entitlement culture contaminating the world. In Jordan Peterson’s first mainstream book release, 12 rules for life, he writes–somewhat longwinded, that young men need to sack up and adopt responsibility. A life of box, watching others stream video games about little lego worlds made of cubes is not the way to happiness–it’s the way to a life seeded with un-satisfaction and self-doubt. The way to being happy, involves setting goals and seeing them through because humans need to see improvement to feel good about themselves. We’ve already written articles about Dr Peterson in the past, including a review of his magnificent authoring program called Self Authoring. 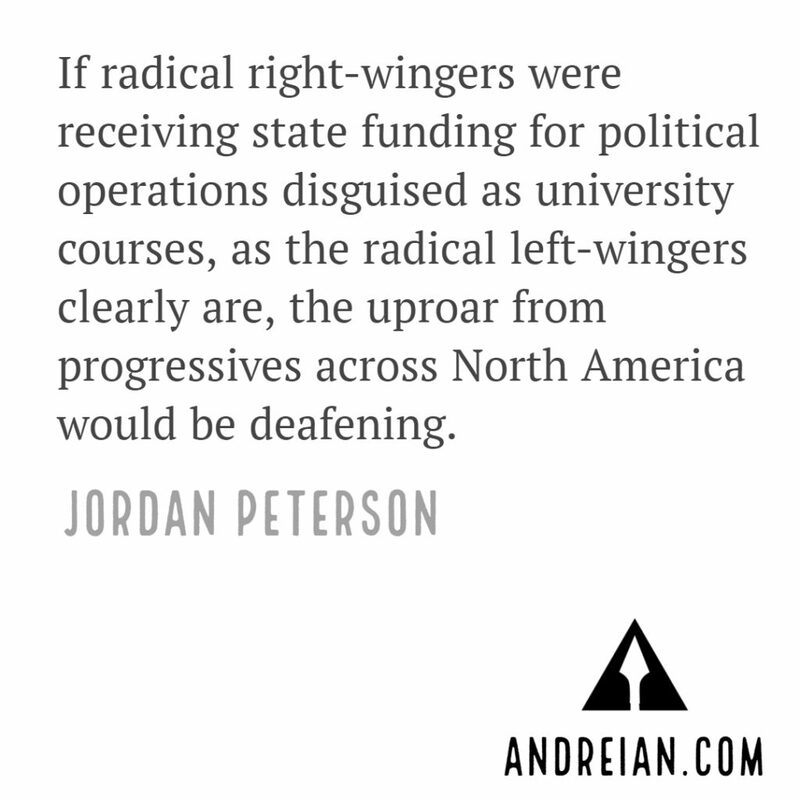 Below are articles for you to read and learn more about Dr. Jordan Peterson. You can learn a great amount by reading the smallest quotes. 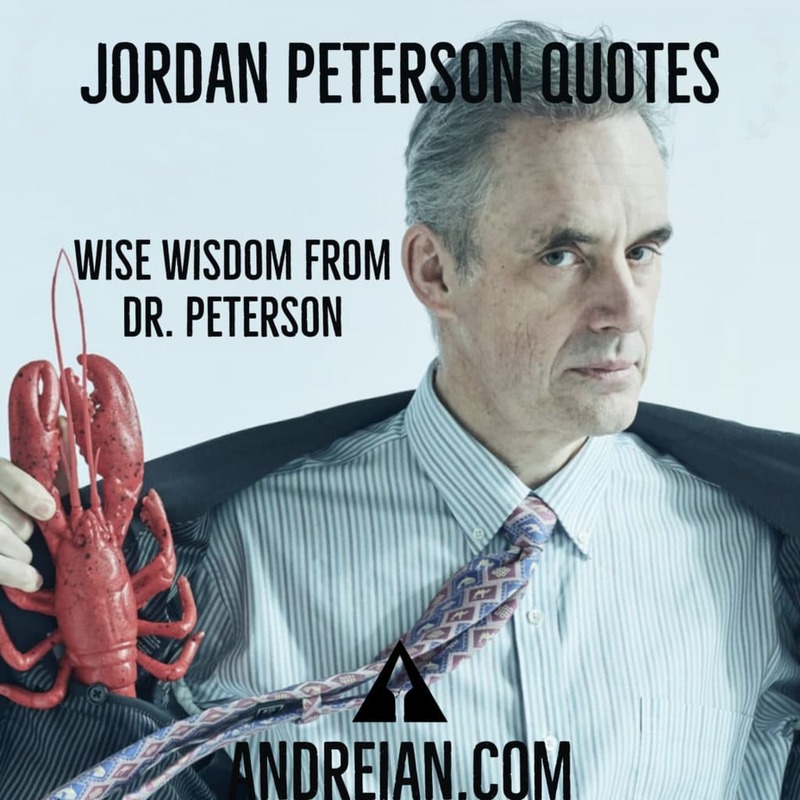 Jordan Peterson’s quotes will resonate with you, particularly around freedom, discipline, and the will to win. 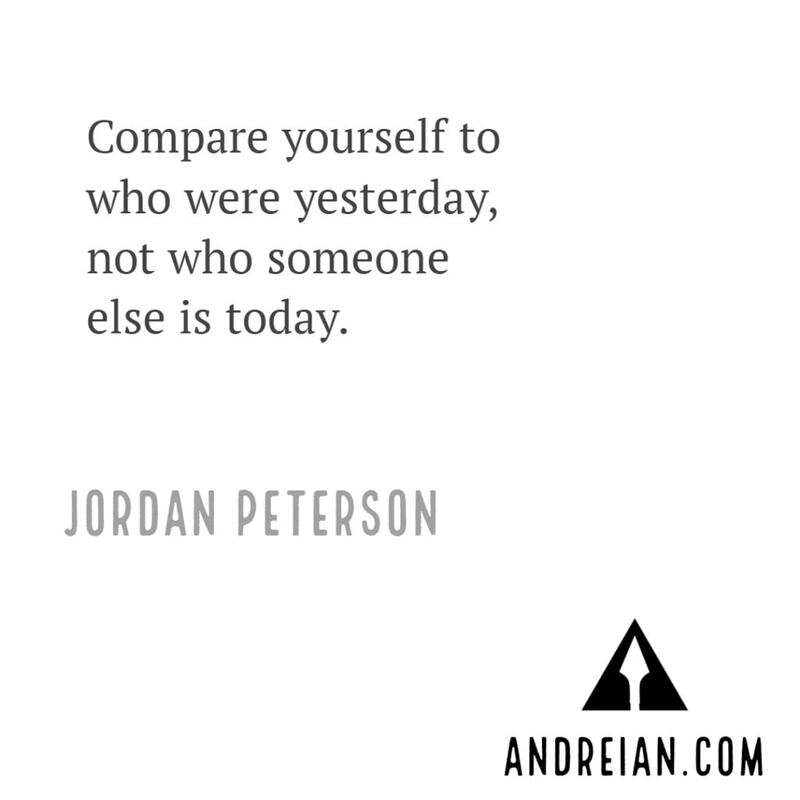 Below are various quotes from Jordan Peterson. Some came from his book, 12 rules for life. 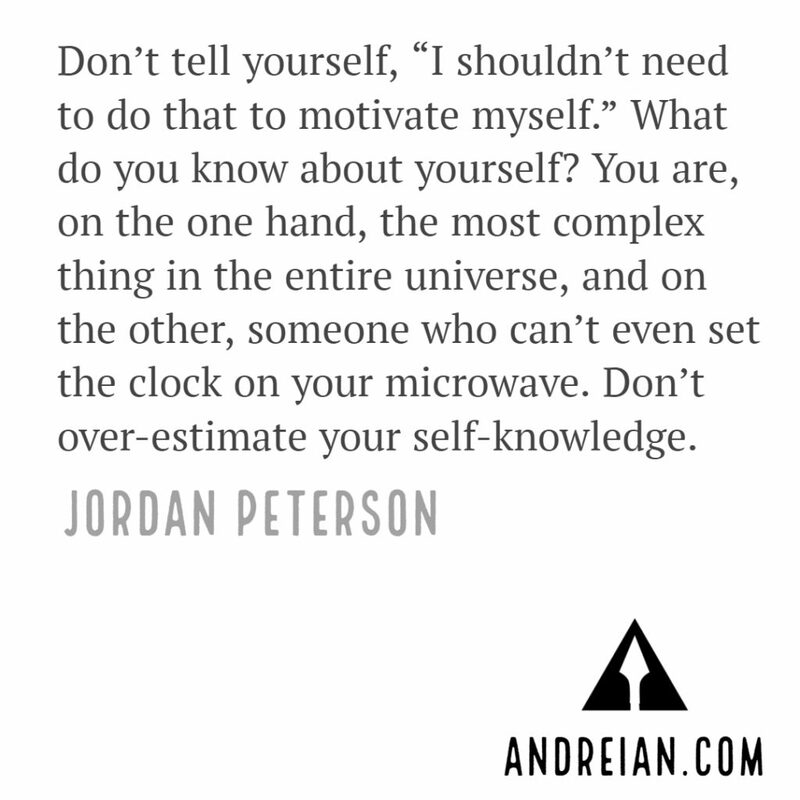 Other quotes came from podcast interviews Peterson was a guest on. Do you have a favorite not listed below? Drop it in the comments. If any of the quotes resonate with you, save them. Share them on social. If you share our images, we’ll be eternally grateful. The only way to test if authority is real, is pushing against it. Stop being so compliant all the time. Rules must be tested. Some women don’t want to lose their baby boys so they keep them–forever. Don’t be dependent at all. Period. What would your life be like if you made use of all of the potential you were offered? Being harmless isn’t a virtue. If you can say what you’re doing, you’re not producing art. Art is like a dream. It doesn’t say what it is–it just is. If you make bad decisions–things get worse. Not just for you. You don’t know how your actions echo. It matters what you do. Have respect for yourself. Have fear for yourself. You are obligated not to associate with people who are trying to damage the structure of being. Obviously I’m not perfect but I’m slightly less terrible than I was yesterday. you keep that up for five years and you’re wherever you should be. Most people’s lives are nicely saturated with tragedy. You should be better than you are, but it’s not because you’re worse than other people. It’s because you’re not everything you should be. There’s absolutely no doubt you can be slightly better tomorrow than you are today. Sometimes you’re done. Most of the time you aren’t. If you’re in a nursing home, you’re done. If you aren’t dead. Keep Going. There’s still time. lies make you weak – and you can feel it. You want to enter a conversation and come out wiser than you went in. 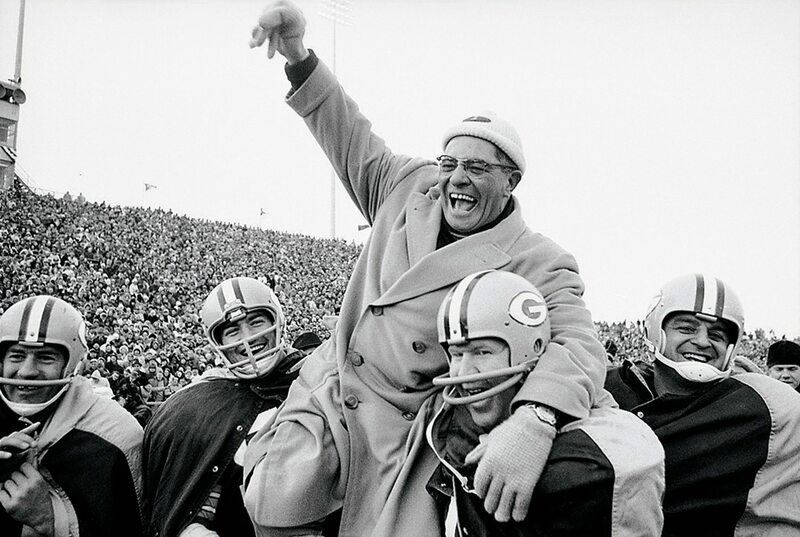 Winning when you’re wrong is a really bad idea. Discipline is a matter of being terrified of the right things. People often act out complexes before they understand them. Humans treat the future as something they can bargain with. If you aren’t moving forward in your life there is some idea, mode of action, or habit you’re so in love with you won’t let go of it. People need believe systems to exist. People who live by the same code are rendered mutually predictable to one another. They act in keeping with each other’s expectations and desires. They can cooperate. They can even compete peacefully, because everyone knows what to expect from everyone else. A shared belief system, partly psychological, partly acted out, simplifies everyone— in their own eyes, and in the eyes of others. without rules we quickly become slaves to our passions— and there’s nothing freeing about that. Chaos is what emerges more catastrophically when you suddenly find yourself without employment, or are betrayed by a lover. As the antithesis of symbolically masculine order, it’s presented imaginatively as feminine. It’s the new and unpredictable suddenly emerging in the midst of the commonplace familiar. It’s Creation and Destruction, the source of new things and the destination of the dead (as nature, as opposed to culture, is simultaneously birth and demise). Territory matters, and there is little difference between territorial rights and social status. It is often a matter of life and death. A vanquished competitor loses confidence, sometimes for days. Sometimes the defeat can have even more severe consequences. The acts of life we repeat every day need to be automatized. They must be turned into stable and reliable habits, so they lose their complexity and gain predictability and simplicity. This can be perceived most clearly in the case of small children, who are delightful and comical and playful when their sleeping and eating schedules are stable, and horrible and whiny and nasty when they are not. Our anxiety systems are very practical. They assume that anything you run away from is dangerous. The proof of that is, of course, the fact you ran away. But just as often, people are bullied because they won’t fight back. It is not virtuous to be victimized by a bully, even if that bully is oneself. You need to consider the future and think, “What might my life look like if I were caring for myself properly? It’s appropriate and praiseworthy to associate with people whose lives would be improved if they saw your life improve. No matter how good you are at something, or how you rank your accomplishments, there is someone out there who makes you look incompetent. We are not equal in ability or outcome, and never will be. A very small number of people produce very much of everything. The winners don’t take all, but they take most, and the bottom is not a good place to be. If the critical voice within says the same denigrating things about everyone, no matter how successful, how reliable can it be? Maybe its comments are chatter, not wisdom. Furthermore, every activity, once chosen, comes with its own internal standards of accomplishment. If something can be done at all, it can be done better or worse. To do anything at all is therefore to play a game with a defined and valued end, which can always be reached more or less efficiently and elegantly. Every game comes with its chance of success or failure. You could watch the precious days tick by. Or you could learn how to entice yourself into sustainable, productive activity. Do you ask yourself what you want? 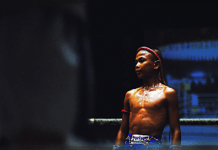 Do you negotiate fairly with yourself? Or are you a tyrant, with yourself as slave? Should is your responsibility, and you should live up to it. Our eyes are always pointing at things we are interested in approaching, or investigating, or looking for, or having. We must see, but to see, we must aim, so we are always aiming. Five hundred small decisions, five hundred tiny actions, compose your day, today, and every day. Could you aim one or two of these at a better result? Modern parents are terrified of two frequently juxtaposed words: discipline and punish. They evoke images of prisons, soldiers and jackboots. Be good company when something fun is happening, so that you’re invited for the fun. Act so that other people are happy you’re around, so that people will want you around. A child who knows these rules will be welcome everywhere. Stop saying those things that make you weak and ashamed. Say only those things that make you strong. Do only those things that you could speak of with honour. 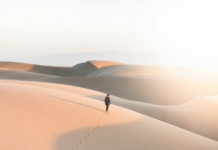 Taking the easy way out or telling the truth— those are not merely two different choices. They are different pathways through life. They are utterly different ways of existing. If you will not reveal yourself to others, you cannot reveal yourself to yourself. Chris started by hating men, but he ended by hating women. He wanted them, but he had rejected education, and career, and desire. He smoked heavily, and was unemployed. Unsurprisingly, therefore, he was not of much interest to women. That made him bitter. I tried to convince him that the path he had chosen was only going to lead to further ruin. He needed to develop some humility. He needed to get a life. A stable, loving relationship is highly desirable, for men as well as women. For women, however, it is often what is most wanted. Aggression underlies the drive to be outstanding, to be unstoppable, to compete, to win— to be actively virtuous, at least along one dimension. Determination is its admirable, pro-social face. The world is a forum of sharing and trading (that’s Rule 7, again), not a treasure-house for the plundering. To give is to do what you can to make things better. The good in people will respond to that, and support it, and imitate it, and multiply it, and return it, and foster it, so that everything improves and moves forward. The idea that life is suffering is a tenet, in one form or another, of every major religious doctrine, as we have already discussed. Buddhists state it directly. Christians illustrate it with the cross. Jews commemorate the suffering endured over centuries. Such reasoning universally characterizes the great creeds, because human beings are intrinsically fragile. Cooperation is for safety, security and companionship. Competition is for personal growth and status. However, if a given group is too small, it has no power or prestige, and cannot fend off other groups. In consequence, being one of its members is not that useful. I teach excessively agreeable people to note the emergence of such resentment, which is a very important, although very toxic, emotion. There are only two major reasons for resentment: being taken advantage of (or allowing yourself to be taken advantage of), or whiny refusal to adopt responsibility and grow up. Share this article if you found any of these quotes valuable–don’t forget to save your favorites.